What changes will make the 2018 GMC Acadia different? Probably little outside of new paint colors and higher asking prices. GMC’s upscale midsize crossover SUV got a clean-sheet redesign for the 2017 model year. New styling, engines and features were part of the first redo since its model-year 2007 introduction. Most significant, the second-generation Acadia shrunk, losing 6.4 inches of wheelbase (distance between front and rear axles), 7.2 inches of body length, and 3.5 inches of width. It’s roughly 700 pounds lighter than its predecessor, too, so it’s nimbler, easier to drive, and more fuel efficient. But it’s no longer a class leader for passenger and cargo room. Acadia still seats up to seven passengers, but overall spaciousness is now merely competitive with similarly sized three-row rivals such as the Ford Explorer, Honda Pilot, and Toyota Highlander. Acadia’s model-year ’17 makeover also separated it from its General Motors corporate siblings, the Chevrolet Traverse and premium-class Buick Enclave. Acadia’s closest under-skin relative is now the similarly sized Cadillac XT5 premium crossover, which share’s Acadia’s wheelbase and available V-6 engine. Traverse and Enclave, meanwhile, are being redesigned for model-year ’18. While they’ll share some of the redesigned Acadia’s underskin design they’ll retain the larger dimensions of their predecessors and of the first-gen Acadia. The overall market for three-row midsize-class crossovers is down a bit from a couple years ago. Shopper preference is toward smaller, five-passenger models both in the popularly priced category and especially in the premium realm. GMC positions Acadia to straddle the two segments and the redesigned version is off to a strong start. Sales are up 65 percent in Jan. 2017 over Jan. 2016, and it ranks third in its competitive set behind Explorer and Highlander. If you’re looking at today’s second-generation model, you shouldn’t. To clarify: GMC continued production of the first-generation Acadia for model-year 2017 as the Acadia Limited. Don’t expect it to be part of the retail lineup for model-year ’18. 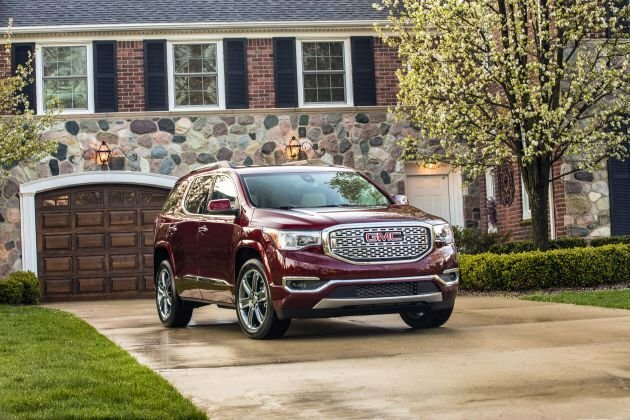 But if you’re looking for a roomy GM crossover that blends the updated styling and features of the new Acadia, with the size and space of the first-generation model, consider waiting for the 2018 Traverse or Enclave. If the downsized Acadia meets your needs, the ’18 version will be a virtual rerun of the ’17, except it’ll almost certainly cost more. Expect the four-tier ’18 lineup to reprise base SL, volume SLE, upscale SLT, and flagship Denali trim levels. SLE and SLT versions will likely again subdivide into SLE-1/SLE-2 and SLT-1/SLT-2 trims. All would come standard with front-wheel drive with traction-enhancing all-wheel drive (AWD) again optional on all but the SL. Yes, for a couple reasons. You’re certain to still have access to the old, larger Acadia Limited. And if you choose the new, smaller redesigned Acadia, you’ll avoid the almost inevitable model-year price inflation for what will essentially be an unchanged 2018 model. The redesigned Acadia is well proportioned, smooth, quiet, and refined. The Limited shares some of those characteristics, buoyed by exceptional interior room, but it feels sluggish and generally drives like the large vehicle it is. If you do choose a ’17, be aware that despite a product portfolio that’s basically retrimmed copies of various Chevrolet crossovers, SUVs, and pickup trucks, GMC is GM’s hot brand of the moment. As such, cash-back and cut-rate financing on the ’17 Acadia aren’t likely to be as strong as incentives on rivals from GM or other companies. But there are still deals to be had. As of early 2017, for example, certain 2017 Acadias in dealer stock were eligible for a cash rebate equivalent to 17% of the manufacturer’s suggested retail price. On an Acadia Denali, that could mean savings of more than $8,000. Expect such offers to expand as the 2017 model year winds down and dealers begin clearing showroom space for the ‘18s. No, and that’s a good thing. Leaving the first-generation Acadia to its fate, the smaller second-generation version boasts strong lines and deft proportions. The look is part of GMC’s “Professional Grade” brand identity and whether you buy that line or not, Acadia and most other GMCs at least look distinct from their Chevrolet and Cadillac counterparts. Expect all versions of the 2018 Acadia except the SL to again sport LED daytime running lights. The trim will again get fancier as you ascend the model line, with the Denali again having, among other unique touches, its own cheese-grater grille design. The Denali alone accounts for a significant portion of Acadia sales, so lots of people like the look. We prefer the cleaner three-bar grille that’s on the other models. Available again on AWD SLE-2 and SLT-1 models will be the All Terrain package, which adds a body-color grille, black-chrome accents, and specific wheels. All Terrain Acadias forego the otherwise standard third-row seat in favor of underfloor storage bins. Interior comfort is quite good in the first two seating rows. The cramped third row is suitable for small children and access to it is more difficult than in slightly larger rivals, such as the Pilot, Highlander, and Nissan Pathfinder. Acadia’s cargo volume is 79 cubic feet with the second- and third-row seats folded. This puts the GMC near the back of the competitive set. For reference, the first-generation Acadia boasted more than 100 cubic feet of cargo space. No. The ‘18 Acadia will continue with a choice of four- and six-cylinder engines. Again standard on SLE, SLE-1, and SLE-2 models and on the front-wheel-drive SLT-1 will be a 2.5-liter four-cylinder with 193 horsepower and 188 pound-feet of torque. It provides adequate acceleration, provided you’re not carrying a full complement of passengers and/or cargo. Wisely, the majority of Acadia buyers will likely continue to choose the available 3.6-liter V-6 engine. It should return with a robust 310 horsepower and 271 pound-feet of torque and provide the pickup and passing power commensurate with the needs of a crossover this size. Expect the V-6 to again be standard on the SLT-2, AWD SLT-1, and Denali models and to be available for an additional $1,100 on the SLE and front-drive SLT-1 models. Both engines will likely again pair with a six-speed automatic transmission. That’s OK for the four-cylinder, where cost is a consideration. But for the V-6, we’d encourage GM to upgrade it to the eight-speed automatic used with the 3.6-liter V-6 in the Cadillac XT5. The eight-speed would provide better throttle response and fuel economy. With the six-speed, a V-6 Acadia feels no quicker than the heavier V-6 Highlander or Pilot, despite having more horsepower and roughly the same torque. Where any Acadia shines is handling. Steering feel and reaction could be sharper, but grip and balance in fast turns is very good and few midsize crossovers are more nimble in close-quarters maneuvering. Perhaps, if GM equips V-6 Acadias with the eight-speed automatic transmission. Otherwise, the 2017 EPA ratings should carry over, with front-wheel-drive 2018 Acadias rating 21/26/23 mpg city/highway/combined with the four-cylinder engine and 18/25/21 with the V-6. With AWD, the four-cylinder should again rate 21/25/23 mpg and the V-6 18/25/20. These numbers are decent for the class but trail some rivals that have more passenger and cargo volume, including Pilot and Pathfinder. The ’18 Acadia will also return a couple of tech tricks whose benefits are not reflected in EPA ratings but likely improve fuel efficiency slightly. The four-cylinder would again include an idle stop/start system that shuts off the engine at a stop and instantly restarts it when the driver releases the brake pedal. The V-6 will include GM’s Active Fuel Management, which saves gas by shutting off half the cylinders during cruising and under light throttle. All models would continue to be tuned for 87-octane gas. Unlikely, given this second-gen model would be in only its second model year. GMC would do well, however, to consider expanding availability of some key safety systems that have been exclusive to the SLT-2 and Denali, where they’re standard. These include lane-keep automatic-steering correction and autonomous emergency braking designed to mitigate a frontal collision. These features have been unavailable thus far on the other Acadia models, even as options. They have enabled the SLT-2 and Denali to achieve Top Safety Pick status, the second-highest rating from the Insurance Institute for Highway Safety. To get the IIHS’ top safety rating, Top Safety Pick+, a vehicle must also ace a headlight-performance evaluation. The ’17 Acadia fell short in this test. As for standard and optional features, the 2018 SL trim will remain geared to rental-fleet sales, but should continue to come with tri-zone automatic climate control, pushbutton ignition, and a 7-inch touchscreen infotainment system with built-in support for Apple CarPlay and Google Android Auto. Also standard is GM’s 4G LTE data connectivity. Run through the OnStar service, it essentially turns the vehicle into a rolling WiFi hotspot. Expect the 2018 Acadia SLE-1 to again build on the SL with standard LED daytime running lights and satellite radio. SLE-2 models will again expand on that with a raft of standard convenience features, such as a programmable power liftgate, heated front seats, power driver seat, and remote engine start. Also included on this model are second-row bucket seats, which reduces passenger capacity to six. The three-across bench that has been standard on the SL and SLE-1 is likely to remain available as a no-cost option on the SLE-2 and higher. Buyers of the ’18 SLT-1 should again get leather upholstery, a power front-passenger seat, upgraded audio system, blind-spot alert with rear cross-traffic alert, rear-obstacle detection, and an 8-inch touchscreen for the infotainment system. SLT-2 upgrades should again include driver-seat memory, heated outboard second-row seats, automatic high-beam headlights, front-obstacle detection, forward collision warning with pedestrian detection, autonomous emergency braking, and automatic steering correction should you wander from your lane. The ’18 Acadia Denali will again include all the above, along with unique exterior and interior trim, xenon headlights, hands-free power liftgate, ventilated front seats, and a heated power tilt/telescopic steering wheel. They’ll probably increase, but not much, given the expected carryover equipment levels and strong competition. Expansion of autonomous braking and the like would likely affect the base prices of models below the SLT-2 level. Overall, though, while GMC marketing pitches Acadia as a near-premium-class product – with some justification regarding the Denali – this crossover’s pricing should remain in the thick of what rivals charge for their three-row, midsize entries. Estimated base prices in this review include the manufacturer’s destination fee, which was $925 on the 2017 Acadia. And note that the base prices sited are for models with front-wheel drive. Expect AWD to again be a $2,000-$2,400 option, depending on trim level. Estimated base price for the 2018 Acadia SL is $31,000 and for the SLE-1 it’s $34,500. Most Acadia sales will again be SLE-2 and SLT-1 models, with estimated 2018 base prices of $37,000 and $40,500, respectively. Expect the SLT-2 to start around $44,000 and the Denali around $47,000. As for 2017 models, expect any paint color except white to cost an extra $400-$1,000. Rear DVD entertainment would again be available for an extra $2,000. The All Terrain package for the AWD SLE-2 and SLT-1 would cost $2,000 and $1,800, respectively. The SLT’s rear-obstacle detection and blind-spot/rear cross-traffic alert would be part of an $800 Driver Alert Package on the SLE-2. Built-in GPS navigation would cost $500 on the SLT-1 and SLT-2. 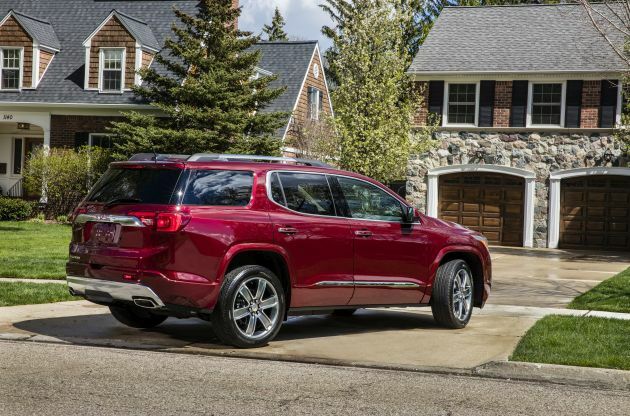 Expect a fall 2017 release date for the 2018 GMC Acadia. Expanded availability of driver aids to the rest of the Acadia lineup would be first on our list. We don’t understand why these features aren’t at least optional on lesser models.